I used to devote hours to jigsaw puzzles. I think I lost my taste for doing them when “Impossipuzzles” become all the rage with their pictures of piles of Smarties or splats of baked beans. Difficult, yes. A fun challenge, no. I believe a fun puzzle is one where you create many small pictures that are gradually joined together to create the whole. 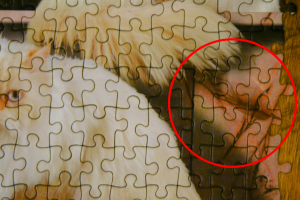 A puzzle picture should be fractal, with interesting details at all scales. So, I still remember my circular Zodiac puzzle – where each of the 12 signs could be pieced together separately. Or the Nostalgia puzzle featuring 100 different boxes and bottles of food from the 1950s. Or puzzles using great works of art with myriad hidden details the artist has worked into the background. The Cat and Mouse puzzle fits the bill in this respect. There are plenty of ways into the puzzle with individual cats, or the hard horizontal lines of the shelves they sit on, or the vertical lines that separate slabs of marble in the background. The lack of edges forces you to use the picture itself as your starting point and is also a great idea. The problem comes with the execution. The box art image is crisp and vibrant. The printing of the pieces is blurred and under-saturated. 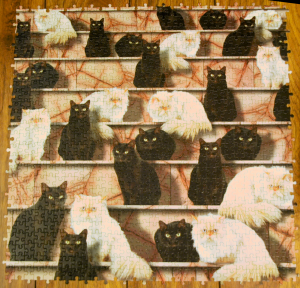 This meant that the black and white cats are just masses of a single colour, not interesting individual pictures to piece together. Solving the puzzle required tracing all the edges and then filling in the centres through trial and error. The joy was lost and only a mechanical exercise remained. A real shame for what could have been a great puzzle. Perhaps later printings were better. The BePuzzled range still exists and focuses on Murder Mystery puzzles. I’ve often seen these in charity shops and am tempted enough to pick one up to see if the printing quality has improved, but I can’t recommend them based on this first experience. It turned out that the box art shows about 75% of the full picture, so I’m not giving anything away by posting my photo of the finished puzzle. Anyway, knowing what the picture looks like doesn’t really help because of the blandness of the printing. The final puzzle of finding the hidden mouse was also a real downer. The hidden mouse was a vague and uninspiring outline of a computer mouse in the bottom right corner. I suspect this was also spoiled by the poor printing. Given some of the frustrated comments I’ve come across on the Internet, I feel it’s a public service to point it out. I should get back into doing jigsaw puzzles. Hopefully, the next one I find will be as good in its execution as its conception.